Are there any jackalope fans out there? Let me hear you cheer and make some noise for the Plush Jackalope 16 Inch Conservation Critter by Wildlife Artists. The lifelike, realistic features of this stuffed jackalope are going to absolutely blow your mind. Measuring sixteen inches, this jackalope stuffed animal is conveniently sized to take with you wherever you go. And at such an affordable price, how can you say no to this stuffed jackalope? From its hilarious plush antlers to its soft, brown plush fur, there's no denying that this jackalope stuffed animal is something truly special. Manufactured with soft, durable plush and stuffed with high-quality materials, this stuffed jackalope has quality you can see and feel. To add to the charms of its exquisite design, just take a look a the details and realism crafted into its color and design. 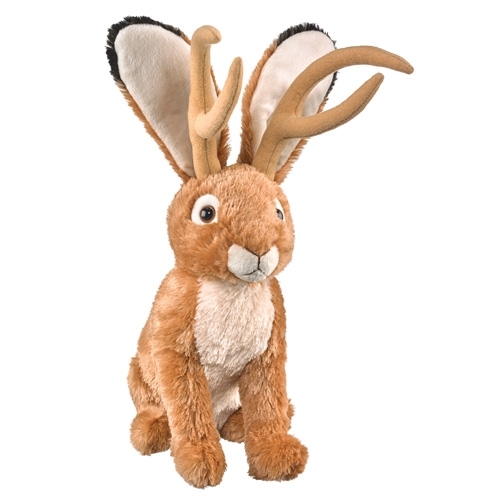 If you're looking for a jackalope stuffed animal, then you need look no further than the Plush Jackalope 16 Inch Conservation Critter by Wildlife Artists. This stuffed jackalope has everything you need. So, what are you waiting for? Get a jackalope stuffed animal of your own today! Products that provoke play and imagination is something we take great pride in at stuffed safari. We love great products like this stuffed jackalope. As with the entire line of unique stuffed animals by Wildlife Artists, the Plush Jackalope 16 Inch Conservation Critter by Wildlife Artists is made with all new child safe materials and meets or exceeds all U.S. safety standards. Recommended for ages three and up, we suggest surface washing for this jackalope stuffed animal.